Indonesian cuisine is one of the most delicious cuisines in the world that is widely known for its richness in spice and flavor. Being only a 60 minutes catamaran ferry ride away, Bintan is the ideal getaway to relax your mind and treat your taste buds. Here’s a list of the top dishes we recommend to try the next time you’re in Bintan. It would be a culinary sin to miss out on them! Similar to Maggi or Ramen, Indomie is the largest manufacturer of instant noodles in Indonesia. It also refers to the dish itself and holds a special place in the hearts of Indonesians. Local restaurants are known to serve Indomie with a side of vegetables, sausage and a fried egg on top. Pictured above is Indomie goreng with fried egg and sausages which we highly recommend at Warung Yeah in Plaza Lagoi. 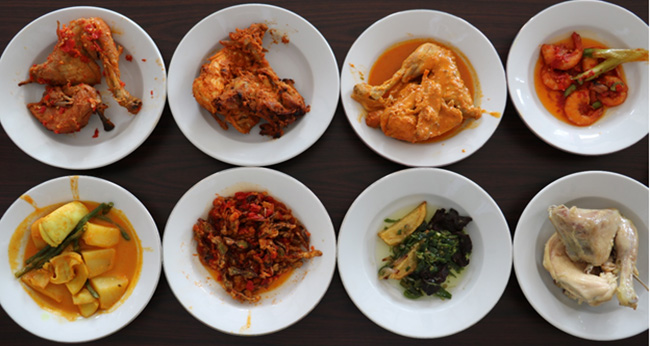 Of course, the variations are endless but one thing’s guaranteed for Indonesians – it tastes like home. 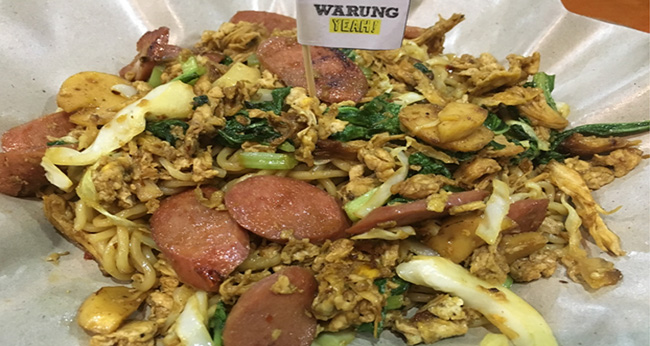 So, make sure to make a pit stop at Warung Yeah or Pujasera food stalls in Bintan to try out this tasty local treat. Also, pick up a few packets from the local convenience stores to bring home as a yummy souvenir! Walk into a Nasi Padang restaurant and you won’t be handed a menu. Instead, mouthwatering local dishes are spread out on the table in front of you. This mini buffet style is what they call “hidang” and you will be charged only for the dishes you eat. Following the traditions of the Minangkabau people (an ethnic group indigenous to the Minangkabau Highlands of West Sumatra), visitors are served a variety of dishes which includes some of the must tries in Indonesia, such as Gulai and Rendang Padang. Gulai is a succulent, thick and spicy coconut-based gravy that is typically yellowish in color and is usually cooked with some type of meat. Rendang Padang entails beef or mutton that is slow-cooked over a duration of up to seven hours and is much drier and darker in color than normal Rendang in neighboring countries. In Bintan, have a taste of this authentic Indonesian cuisine at Lamak Basamo in Plaza Lagoi or Sederhana Nasi Padang in Tanjung Pinang. Indonesia’s Ayam Goreng Kalasan is fried braised chicken served with steamed rice, cucumber, sweet basil and sambal bajak. What makes this dish truly Indonesian is the accompaniment of sambal bajak - a hot sauce typically made from a mixture of a variety of chili peppers, shrimp paste, fish sauce and vinegar. Better known as sambal belachan in its neighboring countries, sambal bajak is commonly eaten in Indonesia with fried foods as a condiment. Named after its place of origin in Kalasan, Yogyakarta, the Ayam Goreng Kalasan is popular for its bumbu seasoning which seeps into the tender meat. Try it out at Spice Restaurant while you’re in Bintan! 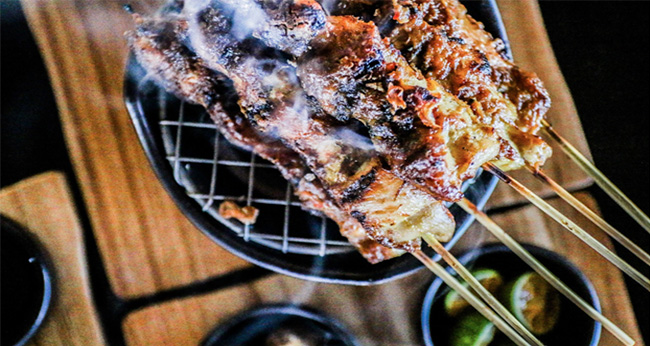 Sate is a grilled skewered meat served with delicious dipping sauce made from soy and peanuts. Sate is also popular in its neighboring countries but Indonesian sate is often coated in the peanut gravy before being served. Sate Madura is one type of sate variant that is popular among Indonesians. It uses thinner chunks of meat as compared to other sates and its black sauce contains kecap manis (sweet soya sauce) – an Indonesian favorite. Try out the local delicacy at Banyan Tree’s Treetops Restaurant with a view. Otak-Otak is a grilled fish cake that is served using banana leaves, made from a mixture of grounded seafood (fish/squid/prawns), scallions, garlic, and coconut milk which is then bound together using tapioca starch. ‘Otak’ is the word for brains in Indonesian, the idea being that the whiteish gray colour and spongy texture of the dish resembles brains. 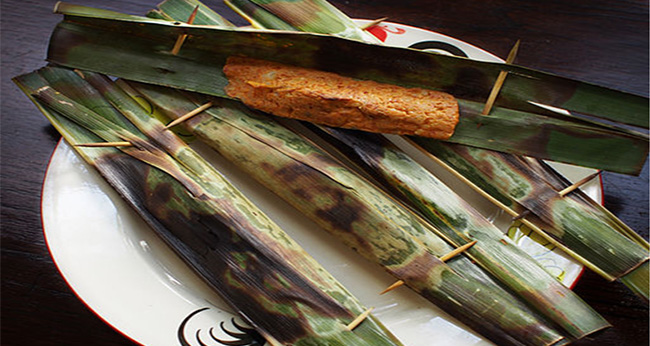 Otak-Otak can also be found in a few other Southeast Asian countries, but those tend to be brighter in color and different in taste, depending on the ingredients and recipe used. One of the best Otak Otak can be found along the streets of Kawal, a local Bintan fishery. The term ‘Ayam Bakar’ translates to roasted chicken, which is usually grilled over hot charcoal. 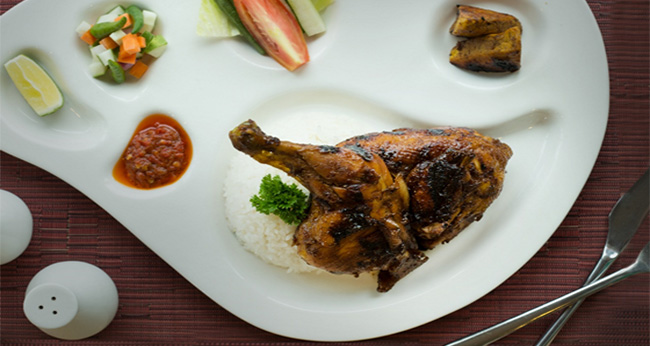 While you will be able to find delicious roast chicken all over the world, what makes the Ayam Bakar one of the top dishes in Bintan is the Bumbu Kecap spice mix that it is marinated in. This spice mixture is made by grinding up shallot, ginger and garlic, chili, tamarind, candlenut, and plenty of sweet soy sauce (kecap manis). It is usually served with sambal kecap, a sweet and spicy dipping sauce that is the perfect accompaniment. 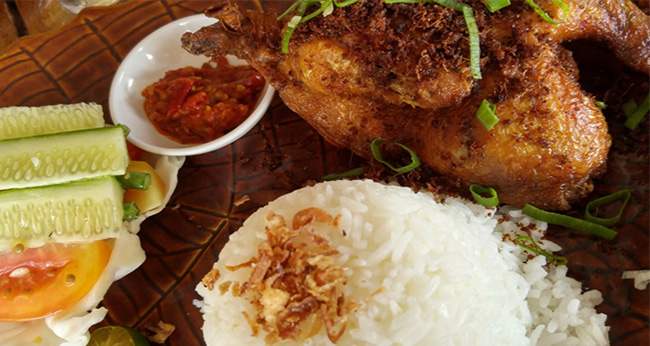 Village Resort Grand Lagoi, Bintan serves up a mean Ayam Bakar Bumbu Kecap for lunch so head over there for a taste of Bintan’s finest!